For any keyword, the Google Search-based Keyword Tool will show up to 800 related keywords with cost and search volume estimates. This tool also works to show you 100 keywords related to a site, and if you own a website they will show you thousands of keywords that they think you could bid on which are not already in your account. In addition they show your search share of voice (via ads and organic search results) for keywords. This data is easy to export using a handy export button. Using a variety of different combinations for these filters you can see many different sets of 800 keywords even within the same subset. Export these different lists a variety of times and you can quickly build a list of thousands of high value keywords. If you are a paying subscriber, this thread has a few more tips for how to get the most out of this tool. I almost would say that I like the tool that is intergrated into adwords since it provides more search terms based on a web-site..
agreed that it doesn't have the cost of each phrase, but i get a better count of searched for the past month.. This tool has keyword click prices on it and lightning fast export. That combination rocks. Good catch Aaron. This is definitely one of those holy grail type things for search geeks. Seems like the data doesn't 100% (or even 50%) match up with what I am seeing in the sites I manage. Maybe I didn't read the FAQs enough. I am assuming what we are seeing here are terms that the sites rank in the top 200 for but not necessarily terms that they get traffic for? If you log in (and are associated with the site you are grabbing data on) they try to show you keywords that they think you should bid on but are not. I just had a quick look (with the usual "don't bother to read the FAQs" bit) and the keyword data for one of my sites seems a bit old. In web terms, at least. Apparently, the site is big in Ringtones, Payday Loans etc. etc. A while back, the site was hacked and 1000's of links dropped on it. However, the site has been clean for over a month, the G penalty lifted and all the cached pages have been clean for a while too. I did a test with seobook.com and wasn't sure if all the "credit consolidation" type keywords in your result were part of the same attack. I looked at this when it was announced on the Inside Adwords blog. After about 10 minutes I gave up because it was giving me some weird and useless results. Since you've rated it I decided to retry. Associate a Site to your Adwords Account? I keep getting the following warning. "This website is not associated with your AdWords account. You're seeing a limited set of keyword ideas, which may include those already in your account and may or may not be currently active for this website"
If they don't see enough of history and volume associating your adwords account with a site then they won't let you see its stats. I am not sure how refined that limit is though. I use google keyword tool while deciding the category heading, and Meta description. 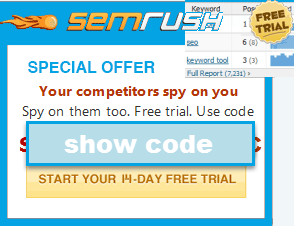 Also I look at compete.com for keywords driving traffic to similar sites. I find it extremely use full to decide the correct synonyms of any given word. Aaron, you were saying the sktool "shows the % of organic and paid traffic going to a URL". I'm not seeing where this data is available, are you talking about the Ad/Search share? Yes...though I think it only shows those stats for sites that you own and are shown as the owner of through your AdWords account history.